Wow, I can't believe a week has already passed in Bali and it already feels like a home away from home. We may have gotten a little sunburnt by underestimating how much suncream we needed to put on (rookie mistake being so close to the equator and all that). It only took around 10-15 minutes to feel the burn and we won't be making that mistake again! Most mornings we got up early to watch the sunrise (thanks to jet lag) and we could see Mt Agung, even though it was around 80km + away. We were staying in a remote part of southern Bali near Uluwatu at La Joya II Biu Biu. If you are looking for a quiet getaway surrounded by lush greenery and bejewelled with clear water beaches and dramatic limestone features then this is your place! Pitaya bowls became one our favourite thing to have for breakfast, the combination of fruit with granola and dragon fruit ice cream is just divine. Pitaya is another name for dragon fruit and the colour is so vibrant. They are just the best thing to get out of bed for! The food here just seems to keep on amazing us, from fresh fruit almost everywhere the food has so much flavour and variety. One of the things we were reluctant to do was to rent a scooter as we had heard many horror stories about accidents and dodgy dealings. Luckily where we were staying we didn't see any of that and it was the best way to get around. We were told that there is tension between taxi drivers and uber drivers. This means that some uber drivers wouldn't pick us up from certain areas as they were worried about the taxi gangs. We got around this by messaging some uber drivers on WhatsApp and then we could contact them, however this was risky for the drivers and we had to not mention uber otherwise the taxi drivers could get angry, especially with low numbers of tourists they are more desperate for work but it is still safe. Renting a scooter was the easiest way to get around the rural roads. Some of the roads were a bit bumpy in places and we would recommend having some previous experience driving a scooter if you are thinking of renting one out here. We loved the experience, it was quick, easy and cheap. It only cost around 70,000Rph (£3) per day compared to 200,000Rph (£10) for a single taxi trip. Hannah has been keeping a travel journal and the pages are filling up quickly, its a great idea as we are organising all our photos by date and makes it much easier to find certain photos when referring to her journal! We loved staying at La Joya II Biu Biu it had everything we needed, infinity pools, a restaurant, a spa and even a private beach! We were sad to leave this place and it really made us feel right at home, we would like to thank Celine and all her staff for hosting us. They were brilliant and we will be coming back for sure. This week we had to extend our Indonesian visa's so that we can stay for longer than the usual 30 day visa given on arrival, this will allow us to stay in Bali for a couple more weeks and then venture onto Java and Sumatra. We had to go to the immigration office in Jimbaran a couple of times (more detailed post to follow), and on the way we were signalled by the police to pull over when we decided to be brave and go by scooter. The police demanded that we pay a fine or go to the court in Depensar as we were not holding an international driving licence. I told them that we did not have enough money to pay the fine which he was saying would be 300,000 Rph (approx £16). I explained that I didn't have that much money with us and we were on our way to the immigration office to get our photos taken for the extension of our visas. After a few moments the policemen decided to let us go. We spoke to some locals later about this and they said we were lucky not to pay a fine. We were told in the future that we might just have to pay a small amount to the policemen and then we would be on our way. We also spent 3 nights this week at Bingin beach. We stayed in a beautiful traditional Balinese beach house with the waves crashing right underneath us as we slept. It was fairly basic but such an incredible location and the perfect place to escape and relax. One night there was a storm that rolled in and woke us up as the rain was so heavy and the waves were so powerful. Towards the end of the week we booked an uber to take us to Jimbaran where we were hosted by Albert at the Kila Infinity8. We really enjoyed our two nights here and spending time with Albert who has so much energy and enthusiasm. Albert told us about the problems caused by the volcano and the way it has been reported in the media. He was actively engaged with the government and the tourism industry to put plans together on how to restore tourism in Bali and how they could be prepared for disaster situations in the future. He also recored a short video of us, where we spoke of our experience in Bali and how safe we feel on the island and that there is nothing to be worried about (we might be famous now thanks Albert haha!) We needed to pick up our passports and new Indonesian visas from the immigration office in Jimbaran on Friday and the infinity8 was perfectly placed at less than a mile down the road. it was the perfect location for those close to the airport and a great central location to many popular destinations. It was a really good feeling to be reuinted with our passports after more than a week of being without them. Fresh fruit is definitely Bali's speciality and you can see why it is named the island of the Gods. There is an abundance of food market stools and banana's that you can get your daily supplies from. Our first week has flown by in Bali and it also feels like we have been here for a long time and look forward to sharing our stories with you next week when we travel to Canggu and Ubud. While out one day looking for lunch we found a cool little caffe called yum yum. We noticed that instead of table numbers each table had a saying. 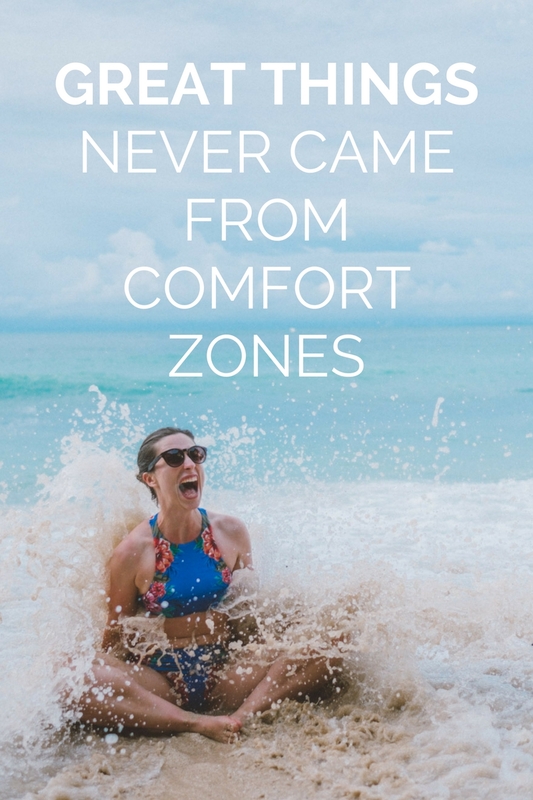 Ours was, 'Great things never came from comfort zones.' We really liked this, as we thought about how we are trying to live by this principle and to try and create content that has meaning. It can be easy to settle for the daily routine as it is safe and comfortable but you will never improve yourself and most likely get sucked into a monotonous way of life. Having a daily routine is good to have and to stick to it but you need to also try something new every now and then and to stretch yourself, discover a new skill, talent or interest. We've found that from travelling from place to place, getting familiar with somewhere and then moving on makes you learn quickly, use your instinct and puts you out of your comfort zone but when you are about to go you don't want to leave. Our first week has flown by in Bali and it also feels like we have been here for a long time and look forward to sharing our stories with you next week when we travel to Canggu and Ubud.